Chase and Ava find an old suitcase filled with strange objects. One of the objects looks like a dragon-headed doorknob... 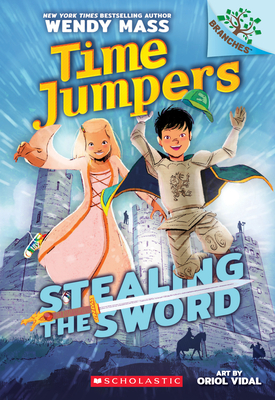 Suddenly Chase and Ava find themselves jumping back in time to King Arthur's castle! They meet the king's wizard Merlin and soon discover what the dragon-headed doorknob really is. It turns out they have an important job to do: They must save the king! But a bad guy is after them... How will Chase and Ava get back home? They will need to act fast to find out! Oriol Vidal's engaging illustrations appear on every page. Newly independent readers will eat up this time-travel series from New York Times bestselling author Wendy Mass! Wendy Mass is the author of award-winning books for young readers, including 11 Birthdays, Finally, 13 Gifts, The Last Present, and the Twice Upon a Time series; as well as A Mango-Shaped Space, Jeremy Fink and the Meaning of Life, Heaven Looks a Lot Like the Mall, Leap Day, Every Soul a Star, Space Taxi, and The Candymakers. She lives with her family in New Jersey.